There are times in your life when everything seems to fall apart and conventional solutions seem to add more to the problem than take away from it. These are the times when most among the burdened people give in to stress eating. However, over a period of time when tables turn and the causes of worry dissipate, the effects of over-eating remains stored in the body in the form of pounds and pounds of excess weight. When realization dawns, it is usually too late. Stop buying stress food – To begin with, it is imperative that you stop buying snacks that are drenched in refined carbohydrates, sugar, salt and a variety of oils. You could however, stuff your fridge with fresh fruits and vegetables along with a few jars of nuts that are rich in omega 3. The difference will be instant and obvious. Distract yourself – Try to draw your focus to something else while feeling the urge to gorge. For example, you can start resetting your cupboard, you could finish that unfinished landscape, you could buy Christmas gifts way in advance, pay a visit to your elderly relatives so on and so forth. Get on the treadmill – This is easy. When you feel a snack attack, think no further and get up on that treadmill (if you have one) and leg it for the next 20 minutes at full throttle. 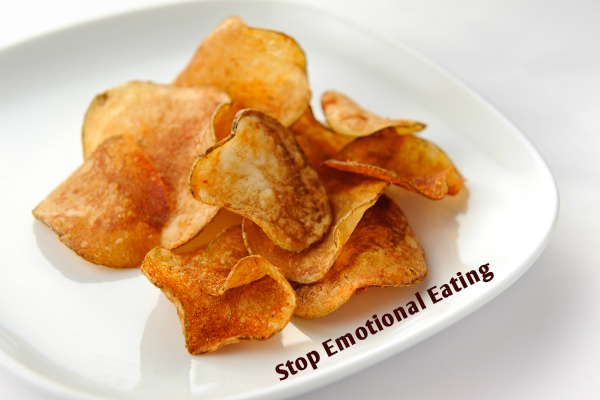 A burst of endorphins will guide your senses to keep at safe distance from emotional eating. Call a friend to unwind – If all that stress in your life has caused you to forget your true friends for a while, this may be the right time to call them up and refresh your system. Sharing bits and pieces of your life and hearing some from them can unload your brain and offer a surge of relief which is seldom temporary. Take online quizzes – Now this is a funny way to add a dose of stimulating and uplifting curiosity to your brain. Do you know which fruit your personality reflects? Or color, or animal or flower or even a celebrity for that matter? Use the internet to fool around in a safe and nice way for a while and see how the distraction cuts down on your emotional eating! Don’t stay awake for too long – The sooner you sleep the lesser you will be drawn to the snack bar. Eat your dinner at a good time; take an aromatic bath, read a funny book and go to sleep. There is no cure known better to the world of the living than slumber. So, allow this miracle worker to work its magic on your eating disorders as well. Be nice to someone in need – Go out of your way and help someone who may be in need of your kindness. It could be about donating some of your things to homeless people or even sharing your food with an abandoned puppy. ← Diet or Exercise? – Which To Choose And Why!